Zipit Shoulder Bags are perfect for carrying smaller items. They’re unique, fun, and as always — reasonably priced. Here are some of the Zipit Shoulder Bags that I can recommend to you. Made form 100% polyester, they’re all very durable and machine washable, too. Here’s the very first Zipit Shoulder Bag, still one of the top-sellers of all times! It includes the trademarked ‘all zip’ design, a comfortable single shoulder strap, and a teethy zip mouth compartment for providing quick access to items like keys or a smart phone. I particularly like that the interior of the compartment is in the same colour of the outside — as it should be! 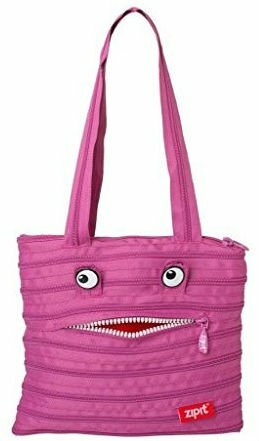 Needless to say, this bag’s striking colours are sure to draw some attention. Its over whole size and ideal straps length makes it endearing to both kids and adults alike. This bag remains a popular choice and will keep on being a very good choice for many years to come. Did you take a look at ‘Alex’ and wish that there was a more sophisticated version of the same bag? Are those bulging eyes and wry smile a bit too eccentric for your taste? 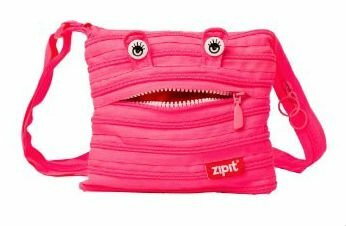 If so, then there’s other Original Zipit Shoulder Bags without the eyes and a mouth. They’re available in Khaki (pictured above), Bordeaux Red, Black, and Light/Dark Pink. These all make for a perfect — and slightly more sensible — alternative to Alex. Original Zipit Shoulder Bags are £15.71 for the Khaki/Black/Bordeaux versions. It’s even cheaper, at £12.29, for the stripy Light/Dark Pink version. Now, let’s suppose you took one look at the ‘Alex’, the Original Zipit Shoulder Bag, and loved it. If that’s the case then the Monster Tote could also be up your street. It has two handles on either side, as opposed to one single strap. You hold it over one shoulder. This means that you don’t have the option to carry it over your head. But the result is a more elegant appearance, which may suit your preference. Purchase the ‘Monster Tote’ Zipit Shoulder Bags in either Bramble or Light Blue for just £15.71. Here’s another smaller option, named Cecilia. Cecilia is for storing a few essential items, such as your keys, wallet or purse, makeup, smart phone and more. Don’t be deceived by her size, though — Cecilia is certainly the sassiest character amongst the Zipit Shoulder Bags range! Try pulling out her red tongue and see for yourself. Cecilia (mini) Zipit Shoulder Bags make an ideal gift for women and young girls. They’re currently available for £12.72. Nice collection of shoulder bags for women, they are trendy as well as stylish. You’re most welcome, glad you like this shoulder bag collection.